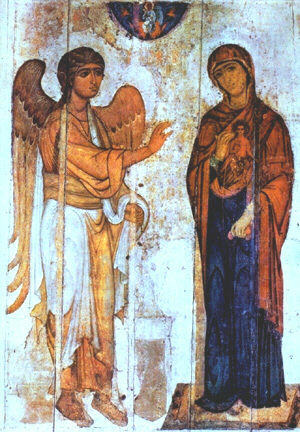 Today, March 25, is the Feast of the Annunciation, the day the angel Gabriel announced to Mary that she would give birth to the Son of God. This feast interrupts the Lenten season even as Gabriel interrupted Mary’s life with news that would forever change her life and the world. On this day the liturgical color changes from Lenten purple to festal white, fasting gives way to feasting, and alleluias again echo throughout the church.